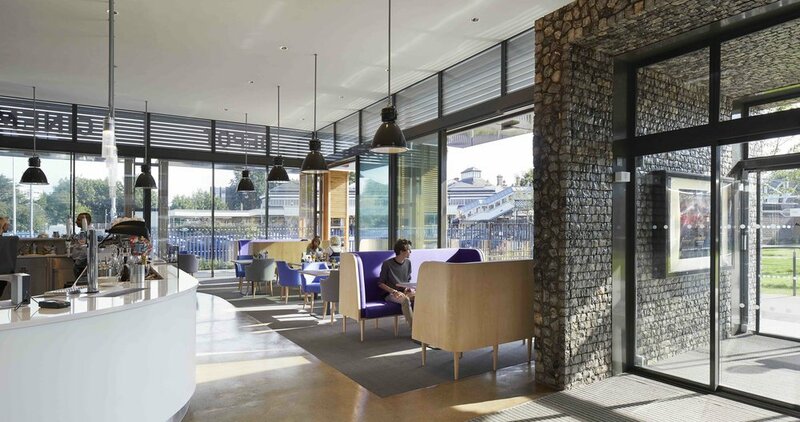 Burrell Foley Fischer were commissioned by Lewes Community Screen in East Sussex to design a new three-screen community cinema on the site of the modest but much loved existing warehouse of the old Harveys brewery depot. The three screens (140, 129 and 37 seats) have been discreetly inserted within the saved brick shell. The major design move was to attach a new glazed extension with the depot structure fully visible as the historic backdrop to the new box office, café bar, restaurant. With the new film education and training facilities, it combines to give a contemporary setting to the former industrial building that was a familiar and popular landmark in a prominent location close to the town’s railway station. The former tarmacked service yard is landscaped to provide a new public realm, and includes native plant species to provide seasonal colour and a small orchard and wild flower meadow. The Depot was developed with an appreciation of the location of the site within the South Downs National Park and regard to the statutory purpose of the Park Authority (SDNPA). This includes conserving and enhancing the natural beauty, wildlife and cultural heritage of the area; promoting opportunities for the understanding and enjoyment of the Park’s special qualities by the public; fostering the economic and social well-being of communities living within the National Park; and maintaining the special qualities which together define the SDNP’s sense of place and attract people to live and work in the area and visit. The project creates new habitats that reflect those characterising the SDNP and the previous history of the site as an orchard. The planting to the new green roof over the screens contains species found in chalk habitats. Arable wild flowers are planted in the south-east corner of the site. Provision has been made for swifts and bats. Sustainability has been a key brief and design priority. A Ground Source Heat Pump (GSHP) utilises heat recovery, for example if the ventilation needs cooling and the hot water needs heating the GSHP can cycle energy between the two. The simultaneous heating and cooling allows one unit to undertake both functions and provides cooling to the cinema screens without the need for an external chiller unit. Argon filled specialist glazed screens and doors to the external elevation to the new restaurant and foyers combine high insulation values with maximum intervisibility between inside social spaces and external landscaping. Brise soleil has been installed and optimised to allow the view of the garden whilst minimising unwanted solar gains during the peak summer months. A green roof over the screens provides a high degree of thermal and sound insulation. Solar photovoltaics (PVs) contribute to offsetting a portion of the required grid electrical load. To help ensure the plant is operated efficiently and when required, a Building Management System (BMS) measures temperatures including air, heating flow and return, cooling flow and return and carbon dioxide levels. Low energy LED and fluorescent lights minimise electrical requirements and maximise the life from each fitting. Public areas are controlled via PIR sensors which automatically turn the lights on and off, as required, and integral lux sensors switch the internal lighting off when the natural daylight lux level reaches the designed indoor lux level. The outdoor lighting is controlled via a photocell connected to the BMS to ensure that it is only switched on when the external lux level requires this. The vision for the project was to provide welcoming and accessible, cultural and social facilities for residents of Lewes and the surrounding region, as well as for visitors, and to engage with audiences and users of the facilities across the age and social spectrum, and regardless of abilities. To this end, local access groups were actively engaged with the project from early design stages and through construction and provided guidance on often little understood issues, such as design for people with dementia, for whom there are special screenings. There are also parent and baby screenings, for which buggy storage is available. The equipping of the cinema auditoria with digital projection and technology has provided a facility for audio description and subtitles, which can be delivered to personal smart phones. There is infrared within the cinema and induction loops at sales points.